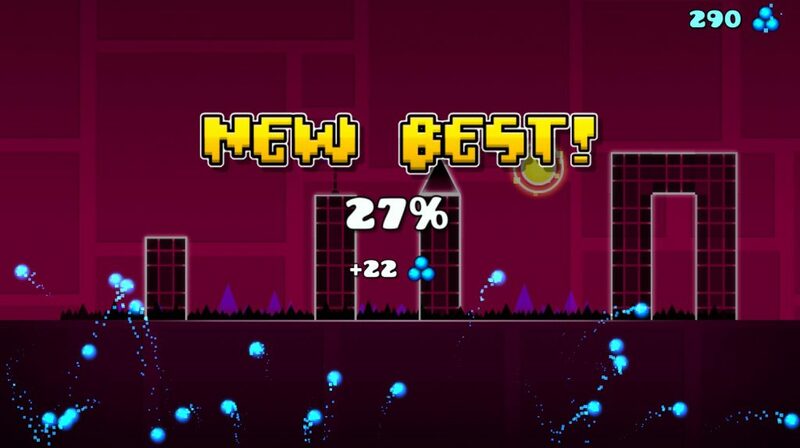 Geometry Dash is an interesting gem among platforming games on Steam by integrating both classic side-scrolling action and instant-death survival mode to some catchy techno music. Are you up for the challenge of getting all 120 achievements? It is listed as an indie action game and I can totally see why. Geometry Dash shares many similarities with its predecessor, The Impossible Game, another rhythm-based platformer that bragged about its extreme difficulty. This explains why people kept accusing Geometry Dash of being a rip-off, but I strongly disagree. The title screen is already well-animated as blocks, rockets, gears, spider-bots, and even UFOs move quickly, leaving a trail of pixels. The left button takes you to the customization menu and the right one has all the player-created levels. Press “play” to attempt one of the original levels. They are ranked from beginner, easy, standard, hard, extreme, or nearly impossible, indicated by the emotes. Stay away from the angry-looking faces to avoid breaking your keyboard. 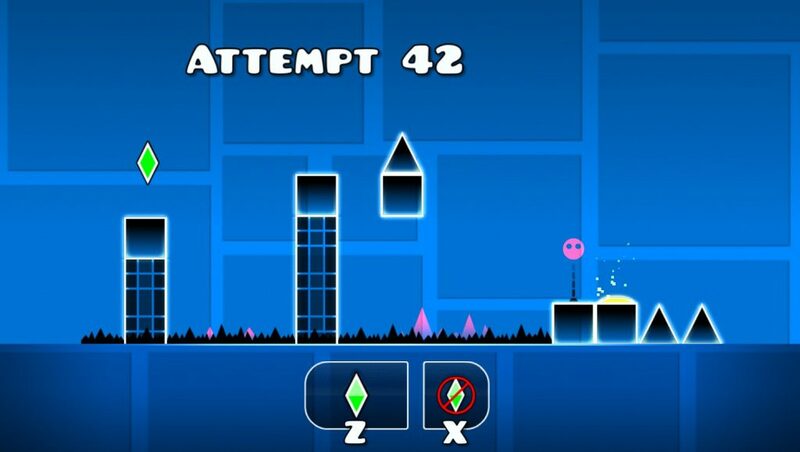 The main objective of Geometry Dash is to jump and fly your way across the level without landing on deadly spikes nor crashing into any walls. But don’t worry, you’ve got practice mode to hone your reflexes and face these difficult trials. Press “Up” to jump and “Esc” lets you toggle your settings. Yep, that’s it. Your avatar will move to the right on its own. But don’t let your guard down, as this game expects you to have top-notch accuracy in timing all your jumps. Any single mistake will force you to restart at the beginning of the level which means listening to the first 10 seconds of the music over and over again. Pay attention to the rhythm as it helps you decide when is the best time to jump. There are at least three different game modes available so far. (The game is still being updated.) Every soundtrack has a Normal Mode and a Practice Mode, along with progress bars on the % completion. Main soundtracks are provided here. Now you don’t have to get 100% on every level to hear the music! I’ve uploaded the music for every single stage from easy to extreme difficulty. This is your run-of-the-mill playthrough of the original levels with soundtracks courtesy of Newgrounds. There are 13 levels in total. The first four are considered “easy”. But good luck surviving the other nine if you can get past the first 15 seconds. To access practice mode, press the “green diamond” button in the game’s settings. Now you can drop green diamond checkpoints anywhere you want on the level. Each time you die, you are sent back to the last diamond you dropped. Remember to avoid adding checkpoints in mid-air or right next to a spike as you won’t be able to react fast enough! Sadly, the soundtrack will be replaced so you are forced to listen to the same music no matter what level you practice. The Lost Gauntlets resemble elements including Fire, Ice, Poison, and Shadow. Each one has five levels, except you must beat the first one to unlock subsequent ones. These are no joke and will truly test your endurance. You are rewarded handsomely upon completion. I haven’t gotten very far in the gauntlets. But if you are exceptionally skilled (i.e. Finish every level), then you can unlock both the Chaos and Demon gauntlets. There are surprisingly many secrets in the game to discover such as collecting all 50 diamonds. Under “Featured” are the user generated levels that have reached the front page. A lot of these level maps have over 10,000 downloads online and at least 1000 likes. 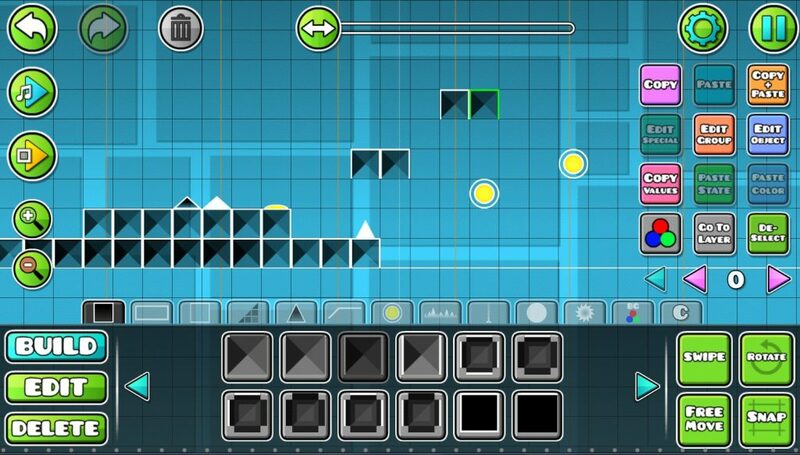 I wasn’t expecting Geometry Dash to have so many fans who could create such beautiful maps. 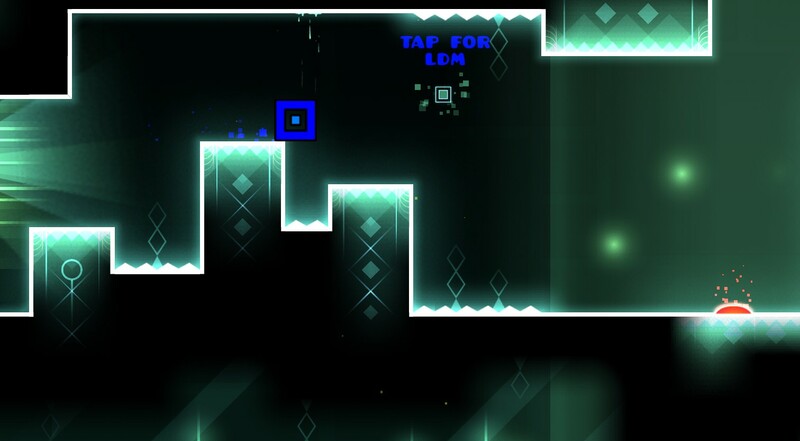 You gotta admire the lighting on this level as it matches well with the triangular patterns. My only complaint with player-created levels is the lack of distinction between the background and the platforms themselves. That quickly becomes disorienting. 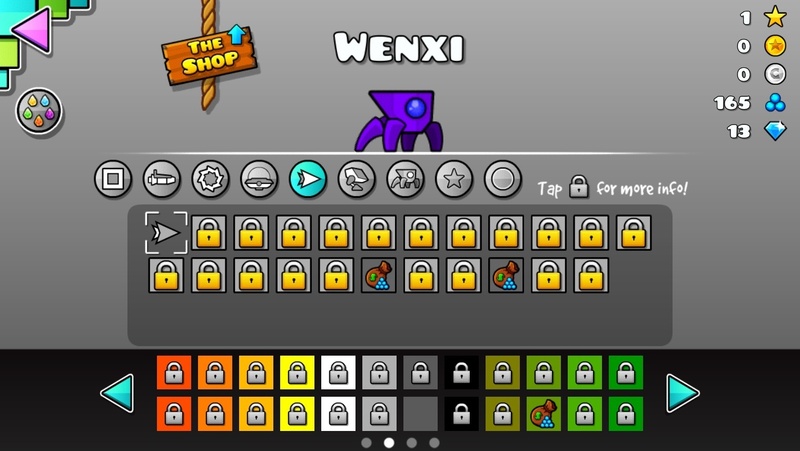 Believe it or not, Geometry Dash has a total of 120 achievements to earn. They do reward you for dedication when you attempt the game at the 100th, 500th, and 2000th mark, dying in a blaze of pixel glory. The other ones you receive are affected by how many good jumps you’ve made, letting you unlock new colors. Liking and rating online levels also unlock more colors but if you get a 100% on practice mode, you’ll obtain new icon skins to try on. The harder achievements often award icon designs to customize. Notice those rockets, UFOs, spiky gears, arrow pointers, and robot skins? You only unlock them once you reach the goal listed. You will have to collect a certain number of stars and secret coins, or be asked to like them on Facebook! The horror! An interesting subject matter is their currency system. It will confuse you early in the game because there is a minimum of six trinkets to collect, the most plentiful being mana orbs. You can collect star coins while playing the levels but stars are only rewarded when you manage to win in Normal Mode. Then you’ll notice the diamonds from daily claims and an entire board devoted to the Shards of Power. Mana orbs are easy to collect because you receive some just by beating your previous record on any level. Star coins are another story where you can’t react fast enough to use the secret paths. Your icon can be customized either by changing its design or color scheme. Pulling the rope reveals a robot shop where you buy new skins or colors using mana orbs. The options are practically endless! I honestly have no idea what’s behind half of these locks. Besides creating icons to your liking, Geometry Dash utilizes several mechanics related to movement. I’ve noticed certain “rules” the icons abide by. The square pieces is a standard slider and jumper. But the rocket lets you propel your icon into the air, affected by gravity. 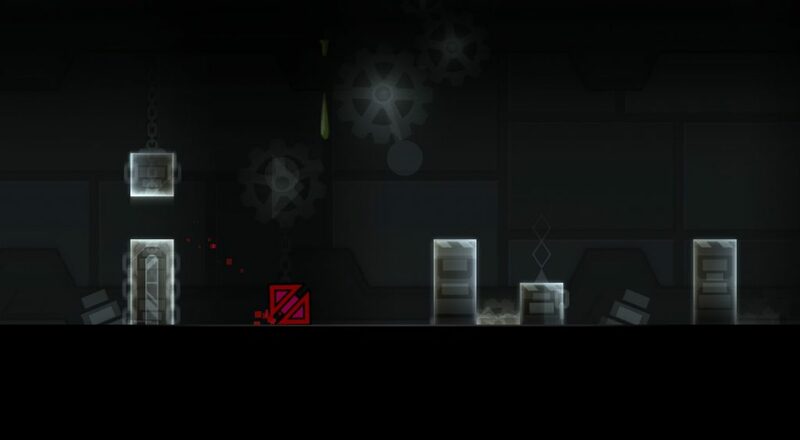 In harder levels, sometimes, your piece turns into a gear which sticks to platforms, weaving back and forth. In other instances, you are a UFO that leaps and travels diagonally. While playing user levels, you might be transformed into a spider bot or a zig-zagging arrow. The game outpaces you at every twist and turns once they throw in flashy portals. By trial and error, you’ll figure out what happens when you pass through one. Portals could reverse direction, turn upside-down, or change your mode of transport. 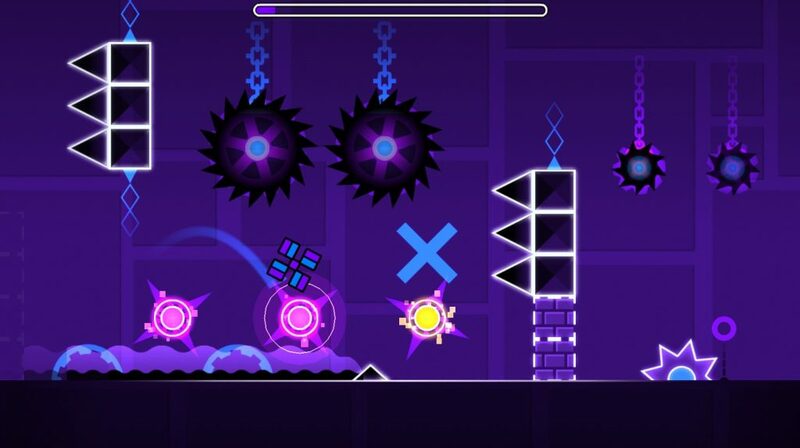 Long-time players of Geometry Dash will certainly love this one. Before I conclude my review, I would like to present Level Creator Mode, where you can generate your own platformers. Now it’s not as easy as it sounds. After all, you’re working with a crap ton of features you aren’t even aware of yet. That’s why I strongly recommend you to read their Editor’s Guide as opposed to jumping in blind. Making a level does require a solid understanding of the rhythmic gameplay. You are able to download any soundtrack for your level. But the spikes, platforms, portals, and mid-air bouncers need to be in perfect sync with the music or else the level won’t be playable at all. It’s a good idea to do some test runs while you are still in the process of building your creation. To learn about adding specific elements to your level, consult the official guide. Keep in mind that building a decent platformer is all about the planning and testing rather than just knowing how to play. It covers how to place props, dangerous obstacles, and alter the physics (i.e. rotate, pulse, shake, or collide) of your game. I haven’t tried to make a level myself but you might have better luck than me. 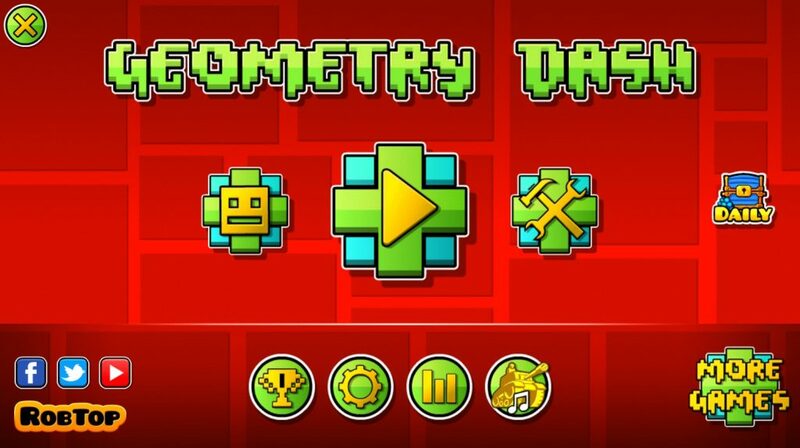 Let me know in the comments if you’ve tried Geometry Dash and how far did you get.